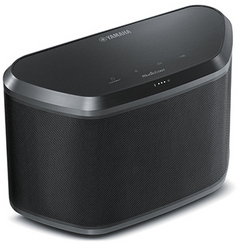 Stream music directly from your smartphone or tablet via Bluetooth or AirPlay®. 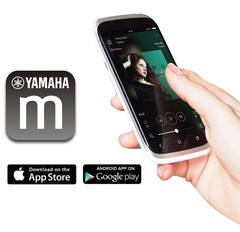 Use the MusicCast app to pause/play and adjust the volume from your handheld device. 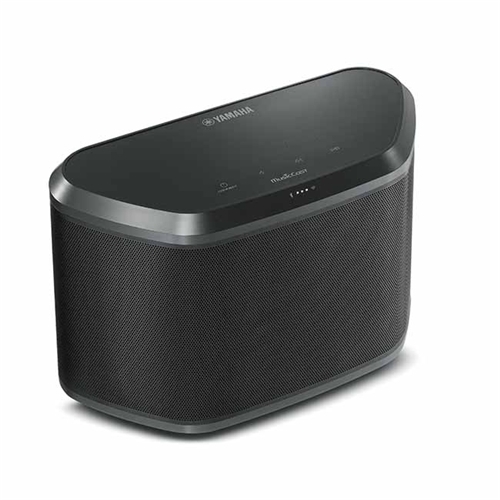 Equipped with Bluetooth technology, you can stream music from the MusicCast wireless speaker to Bluetooth enabled headphones for private listening or any other compatible speaker. 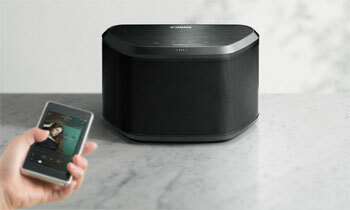 9-5/8" x 6-1/8" x 4-1/2"
MusicCast makes it easy to bring music to every room in your home wirelessly. Whether you start with a single speaker or the ultimate home theater, MusicCast expands to fit your needs, providing wireless multiroom audio playback controlled by a simple app. Bluetooth® is a technology for wireless communication between devices within an area of about 10 meters (33 ft) employing the 2.4 GHz frequency band, a band which can be used without a license. AirPlay® provides the convenience of wireless music playback from iTunes®, iPod® / iPhone® / iPad® and Mac® or PC. The DLNA Certified® logo ensures that all relevant mandatory formats and features are supported by the products, and confirms interoperability between devices in support of mandatory formats and features. Meet your new music collection complete with millions of songs, entire albums and artist hits spanning across the decades. This is more than just Internet radio. This is the power to play exactly the songs you want, wherever you are. Give it a try, sign in and start listening. SiriusXM Internet Radio delivers a variety of commercial-free music including Pop, Rock, Country, R&B, Hip-Hop, Jazz, Classical and much more, plus expert sports talk and analysis. You also get exclusive entertainment, talk, comedy, family programming, local traffic and weather and news from your most trusted sources. With the Spotify app on your smartphone, you have instant access to millions of songs. Now you can stream these songs to your Yamaha networked AV receiver when using Connect by Spotify. Just hit play to start streaming music. Additionally, when you listen to music on your smartphone outside and come inside, the song immediately streams to your AVR. You can also personalize playlists and receive phone calls while listening to music.